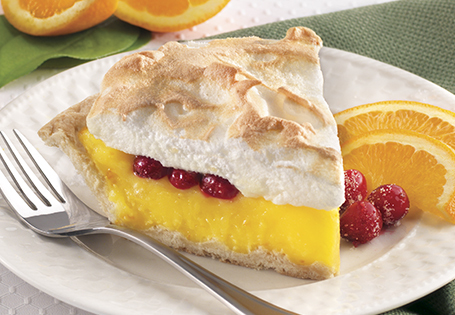 Not your classic meringue, seasonal oranges and sugared cranberries help to create your new favorite holiday pie. For the sugared cranberries: In a small bowl toss sugar and cranberries together. Toss occasionally to recoat cranberries, until ready to use. For the pie: Preheat oven to 400°. Using a fork, puncture crust to prevent air bubbles. Prebake pie crust for 10 minutes or until lightly browned. In a medium bowl, whisk together 4 egg yolks and 1/2 cup sugar. Reserve egg whites for meringue. In a small saucepan over medium heat, whisk corn starch, water, orange juice, 1 cup of sugar and salt. Bring to a boil, continue boiling for 1 minute. Mixture should have the consistency of pudding. Remove from heat and temper mixture into egg yolks; whisking one tablespoon at a time, until half the mixture remains. Return the egg yolk mixture back into the pot. Bring to a simmer and cook for 2-4 minutes, whisking continuously. Add butter. Remove from heat and stir until well combined. Over a medium bowl, strain the mixture, then add orange zest, and stir to incorporate. Pour filling into pie crust. Top with sugared cranberries. For meringue: Using a mixer, whisk together egg whites, cream of tartar and sugar until very stiff peaks form, about 5-8 minutes. Spread meringue over cranberries all the way to the outer crust. Bake for 10 minutes or until meringue turns a light brown color. TIP: Straining orange curd is a key step to remove any egg that may have solidified during the cooking process.